We celebrated the event with another special dinner out. Before that however we took a drive up Mt. Lemmon. from the sizzling daytime temps in the valley. and as you do you pass thru numerous botanical life zones. Around 3,900 we notice the end of the Saguaro Cactus. scrublands you would see further north. in the shadows and on the north facing slopes. and the 6,000' mark, before we had to turn around. is one of the highlights of the road. the right light and clearer skies and you would have quite an amazing shot. But I did get a few "Snow Pictures" for you. Windy Point was also the scene for todays Self Portrait. Soon we had to rush down the Mountain for dinner. Tonights venue was the Amber Polish Restaurant & Gallery. the dining room. Our table was located so as to overlook it. a Hofbrau Heffewiessen Draught for me. sour cream for a warm up. dinners for a wider cross section. For a main course Kate had a Pierogi Sampler. I went for the Polish Sampler. a sweet and sour tomato sauce. plus Sauerkraut and Red Cabbage. When it was time for desert, we both decided to pass. us have put on any poundage we decided not to push our luck. harder to pass than it sounds.... so score one for willpower. So tomorrow we start year 23 of our marriage and it just keeps getting better. Today was one of those classic full moon days. and the staff as this infrastructure falls under my responsibility. One that kept me on the cell phone for 90 minutes.... ugggh! lets just say it was a busy Full Moon Day. it really allows us to put in some sightseeing time in the afternoon. winding down there - and get 4 hours of touring in at the end of the day. but the moon had other plans for us today. So instead let me share a few more shots. Kate posing in front of a Northwest Airlines Lockheed Electra. her round the world attempt in 1937. 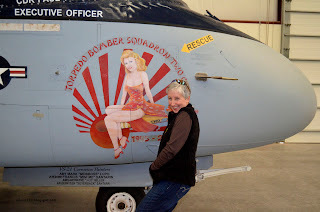 Many of the planes had interesting Nose Art. I have been on a quest to try and capture a certain lighting on the Catalina Mountains. The lighting was mentioned nostalgically by a friend from here. I think I'm starting to zero in on the timing. tonights sunset might be the one. The shot above was my first attempt. That I would get a better view of the mountains. So here I am running around in shorts and a T Shirt. Everyone in the Campground was wearing jeans and sweatshirts. The temps were now in the mid 40's..
As the sun drops out here - the temps drop twice as fast. trying not to run into any low lying cacti on the way..
and by the time I got to the top the light had changed and I was left with this. side of the hill to wait and get a better shot. Ok Linds.... I get it. I now know those colors of which you spoke. try and get some shots for you to give you that elusive taste of home. Today we went to the Pima Air & Space Museum. It is just south of Tucson next to Davis-Monthan AFB. over 100 years of aviation history. Jets silhouetted against the nearby mountains. As a licensed pilot - I was like a kid in the candy shop. but I'll try to keep the list reasonably short. after the war but continued to see forest fire service into the 1990's. It had a top speed of 290 mph with a 2,100 mile range. The Boeing B29 Superfortress was introduced towards the end of WWII. It was designed as a "Hemisphere Defense Weapon"
It's 4 piston engines developed 2,200 HP each. and remote control machine gun turrets. It had a top speed of 358 mph with a 4,100 mile range. The Convair B36 - was a unique aircraft in many ways. the WWII era aircraft, and the jets that are now commonplace. part of our arsenal during the early days of the Cold War. It had 6 pusher piston engines that put out over 3,000 hp each. to reduce the takeoff roll. With its 10 engines- "6 to turn and 4 to burn"
was the phrase its pilots used to describe its power plants. It had a top speed of 435 mph with a 10,000 mile range. The Boeing B47 was the first all jet bomber built anywhere in the world. available that the B47 was developed. required mid-air refueling to complete its missions. The B47 was the aircraft featured in the book and later the movie "Fail Safe". It had a top speed of 606 mph with a range of 4,000 miles. Finally in the bomber category is the modern big boy of the group - The B52. at 635 mph for 7,100 miles. Saddams Republican guard their goal of a face to face with Allah. There are still about 85 of them in service. and the "Black Sheep" squadron. Its speed was over 400 mph. Another recognizable fighter was the P51 Mustang. The Mustang was arguably the finest fighter of WWII. requirements stipulated that a prototype be ready in 120 days! and pencil - the finest aircraft of the war was designed in 4 months! It was a land based fighter that saw action in the European & Pacific Theatre. It had a top speed around 440 mph. Bring on Tom Cruise & Top Gun. You might recognize the aircraft below from that movie. It had a top speed over 1,500 mph! The C47 is the military version of the DC3. After the war it saw service with the airlines as a commercial airliner. There are many still in service today in various roles around the world. The baby below is one of the Bells of the Ball. the technological achievements represented by this aircraft. Built as a spy plane to replace the U2, the SR71 still holds numerous records. Record for Sustained Altitude 85,069 ft.
NY to London 1 hr 55 minutes. LA to Wash DC 1 hr 4 minutes. This is one Beautiful Bird. The VC118/Douglas DC6 saw service as a commercial airliner. Kennedy replaced it with a jet - the 707.
comfort and safety for the traveling public. The "Connie" used the same engines as the B29. Here is Kate doing the job that she did at Northwest. Look at the line of this Aircraft. The Boeing 707 ushered in the era of Jet Travel. I traveled on a PanAm 707 to Europe when I was a kid. Last but not least - the Cessna 150. This 2 seat monster is the first plane that I ever flew myself. and about a 740 mile range. If you've made it this far... congratulations. You must like planes! see that precipitation of some type was falling. Soon we got some glimpses of new snow on the peaks above. It was an interesting & informative day. I hope you've enjoyed visiting the Museum with us. After Breakfast we took the doods on multiple laps of the campground. I peg it about 4 1/2 miles. A tired Doodle is a happy owner. Tucson holds a special place in Kates heart. Her Uncle Phil & Aunt Rose lived here. I've heard many colorful stories about Uncle Phil & Aunt Rose. as if they were a special kind of people. Joe Bonanno's Chauffer for many years. the 5 bosses (Godfathers) of the NY Mafia Crime Families. early 1930's to the late 60's. of many - was largely based upon Joe Bonanno's life. He retired ALIVE - to Tucson. I do not believe that any Godfather did that before or since. The agreement however was that once he retired - he stayed retired. If he broke that oath - he would be immediately killed. Kate once had dinner at Uncle Phils house with Joe and his wife. line is that they were warm and pleasant people. Today we went in search of Uncle Phil & Aunt Roses Graves. We located them in the Holy Hope Cemetery. Which is incidentally the same Cemetery in which Joe was laid to rest. Joe has the biggest grave marker in the cemetery. After visiting Joe we went in search of Uncle Phil & Rose. We just needed to find it. saying whatever Kate says to the dearly departed. Our next stop was a little lighter, but still about the past. In the early days of the southwest - this area was still "owned" by Spain/Mexico. more about pacification of the locals than enlightenment. in the Sonoran Desert chain. He often visited and preached in the area. to numerous Apache attacks who finally destroyed it in about 1770.
by the more pliable and "reliable" Franciscans. Franciscan Fathers Juan Bautista Velderrain and Juan Bautista Llorenz. mostly using native labor from 1783-1797.
the Native community by which it was built. Moorish influence in the Architecture on a building located in the US. architectural elements on the buildings there such as the Alhambra. with the desert mountains beyond. We managed to squeeze in a lot after putting in a full workday. Like I say - plenty of time to rest when you're dead. and tried to hold the camera as still as I could. Unfortunately not still enough but will have to do for now. was amazing how versatile that little booger was. That would be perfect for my use. Finding one will be a project for this week. The lights go up the side around the hitch and down the other side. running on the inverter as well. Our day began with our usual laps around the campground with the Doodles. I clocked it out and they are getting 2 - 3 miles each day on their little paws. Once back - they settled in for a nap. Its tough being one of our dogs. Cinnamon French Toast with Raisins. a bit of crunch to contrast with the soft interior. Soon it was noontime and that means it's time for Kate and I to hit the trail. Today we walked down the road to the entrance of the park and back. It is about 2 miles each way. I took a Bonus Self Portrait. This is looking from the Park Entrance out to the "Outside World"
The Oro Valley Marketplace is right outside the gates. The campground is about 2 miles down the road and left on a side road. Coach for our pre-dinner hors d'oeuvres. He's the quiet sort - but his face tells a story. Its Christmas Dinner in Tucson! and dug out a nice special bottle of Margaux. one of the finest Chateau in France. $500+. Other vintages of Margaux sell for over $1,000. Chateau. Excellent quality - just minus the "snob factor"
Apple & Pecan Pies that Kate made before we left and then froze. turned into a star filled night sky. So that was our Christmas Day in Tucson. Thanks for joining us and Merry Christmas to Everyone!